with Alexa, Smart phone controlled from anywhere at anytime. shades of white, and colour settings through voice control. can share it to your family members. Just set your favorite color, dim/brighten the light and choose scene modes to fit your needs. special occasions or holidays, bedroom, kitchen, bar, living room, birthday party, etc. up to 80% compared to traditional incandescent bulbs, last approximately 30,000 hours. -Plug in: Simply screw (E26/E27) in the WiFi bulbs, download the app titled "Smart Life". 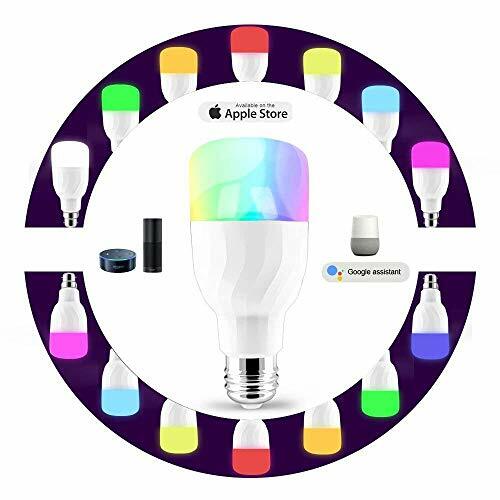 -Download: Connect multicolored bulbs to your home WiFi router through smart phone. -Play: You can set the bulb at your fingertips. -Expand: You can add more bulbs and group control them. ❤️ Voice & App Remote Control -- Control the smart bulbs with your voice using Alexa,Google Assistant, Google Home Mini and IFTTT. Easily voice asked it to turn on/off, brighten/dim bulb and change color. App "Smart Life" Controlled by smartphone/tablet under 2.4GHz WiFi. ❤️ 16 Million Colors & Various Scenes -- The led light wifi bulb allows you choose multiple colors, white/soft white or dim/brighten the light from 0-100%,choose 8 Scenes to match decoration for home, hotel, conference room, museum, bar, cafe, restaurants, birthday party. ❤️ Set Timer & Dimming -- Schedule your RGBW dimmable bulb to turn on or off at specific time. Set the comfortable light turn on automatically to wake up you. The brightness can be adjust 0-100% for you as a night light,reading or rest. ❤️ Widely Usage & Security -- Just freely create color changing Bulb with your personal scenes meet decoration lighting needs. You can add more to a Group and control them at the same time. ❤️ Warranty & Save Energy -- We offer a 24 month worry-free warranty and 30 days money back GUARANTEE for quality issues. Reduce power usage up to 80%. Note:Please use it following the User Manual. If you have any questions about this product by Cotify, contact us by completing and submitting the form below. If you are looking for a specif part number, please include it with your message.